Corn is an a-maize-ing and versatile crop in America and around the world. But most people do not realize just how much corn is in just one bushel of corn that is sold by a farmer for just a few dollars. #2 dent corn, or "field corn" has a variety of uses and is a bountiful crop. So here are a few a-maiz-ing facts about that one bushel. 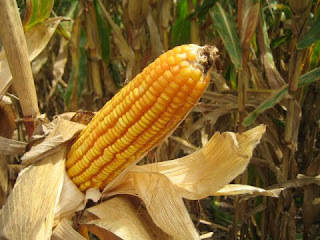 As we've reported here at FoodandFuelAmerica many times, critics who argue that corn ethanol leads to starvation, just don't know the facts about the production and processing of corn. Valuable co-products of the ethanol process, like Dried Distillers Grains, allow valuable animal nutrients to continue to feed the livestock industry. it's not Food or Fuel, it's Food AND Fuel!